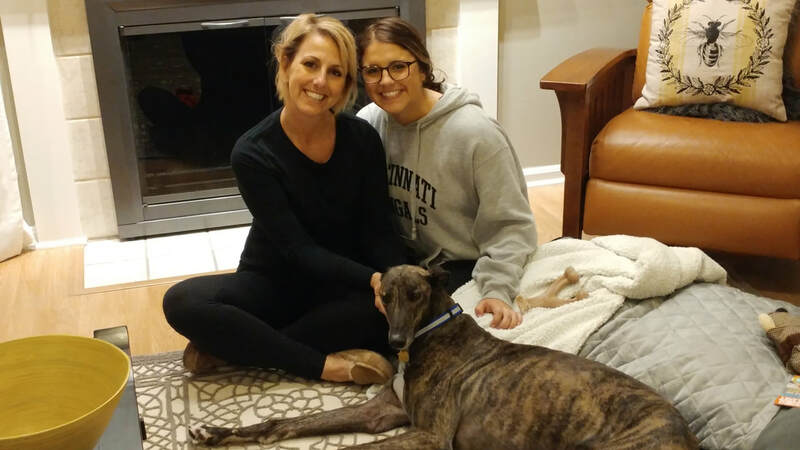 Julie and daughter Morgan of Centerville REALLY wanted a greyhound. Julie went to two different M&Gs on the same day, then they both went to Iron's Fruit Farm the following weekend to meet Stacys Las Elite. The meeting went well, and a second meeting in a quieter setting a few days later sealed the deal. With the new name Enzo, this sweet fawn brindle boy hit the jackpot with his new family and will be much loved. He had such an exhausting day moving to his new home, we had to wake him up for the family photo!